While the sport of Women’s Boxing has been around for decades, the sport didn’t first begin to receive mainstream recognition until the mid-1990’s when fighters like Christy Martin, Lucia Rijker, and Mia St. John each established themselves as stars of Women’s Boxing. Most Boxing aficionados probably remember the Lightweight encounter between Christy Martin and Deirdre Gogarty in March 1996, which was one of the best fights of the 1990’s not just in Women’s Boxing, but in the entire sport. Despite the recognition both fighters earned for themselves and Women’s Boxing in that fight, Women’s Boxing struggled for long-term television exposure and recognition here in the United States for years, despite the sport receiving more recognition internationally where Women’s fights have headlined cards that have also featured men’s bouts. In recent years however, the sport of Women’s Boxing along with the sport of Women’s Mixed Martial Arts (MMA) have garnered overdue mainstream recognition. After all, it wasn’t too far in the past where female boxers were not able to compete in the Olympics. This of course all changed at the 2012 Olympics in London, England where for the first time Women’s Boxing took its place in what is regarded as the biggest stage Amateur Boxing has to offer. Among the competitors at the 2012 London games was American standout Claressa Shields. As most Boxing fans know, Shields emerged from the 2012 games as the lone gold medalist on the United States Boxing team. While most medalists opt to focus on turning professional after competing in the Olympics, Shields would instead set her sights on the 2016 Olympics in Rio de Janeiro, Brazil and make history as the only American boxer to win consecutive Olympic gold medals. After amassing an amateur record of 77-1, Shields embarked on her professional career. Since turning pro in November 2016, Shields has gone unbeaten in eight professional bouts, scoring knockouts in two of those fights and has won world titles in the Middleweight and Super-Middleweight divisions. While some might question how a fighter with eight professional fights could have already accomplish what Shields has in being a two-division world champion, it is important to remember that much like other Olympians throughout Boxing history, Shields was able to benefit from the exposure that being in the Olympics provides and was able to capitalize on valuable television exposure immediately upon turning professional. It is also important to remember that Women’s Boxing is still growing and the path to a world championship is not necessarily the same as compared to what men face in the professional ranks. There is no dispute that in the nearly three years since turning pro Shields has established herself as one of the best fighters in the entire sport female or male. Much like other unbeaten fighters however, the question of who might be able to provide Shields a test does exist. We are likely to get the answer to that question when the WBC/IBF/WBA Middleweight world champion attempts to become undisputed world champion when she meets undefeated WBO world champion Christina Hammer on Saturday night at the historic Boardwalk hall in Atlantic City, NJ. Hammer is also a two-division world champion having won world championships in the Middleweight and Super-Middleweight divisions as Shields has done. The main storyline as this fight approaches in this observer’s mind centers on experience. While Shields arguably has more notoriety due to both the exposure she was able to have in two Olympic tournaments as well as the exposure she was able to have on television out of the gate as a professional, Hammer has more professional experience than Shields has professional fights and will enter this encounter with a record of 24-0, with 11 Knockouts. Some may recall a scuffle between the two that took place following Shields’ victory over Jr. Middleweight world champion Hannah Gabriels in June 2018, in which Shields won the then vacant IBF/WBA Middleweight world championships. Although the scuffle that took place between Shields and Hammer did not result in the two world champions exchanging punches, it did not make either of them appear in a good light or the sport of Women’s Boxing. The incident however, as has been the case in Men’s Boxing through the years in similar circumstances, while giving the appearance of trying to generate publicity for the at that point potential encounter between the two, did nevertheless suggest a genuine dislike between the two fighters. This fight was signed and was supposed to take place in November of last year. The much-anticipated showdown between the two was postponed however, due to an undisclosed medical condition suffered by Hammer. Hammer returned to the ring in February of this year with a second round stoppage of Elene Sikmashvilli in a non-title bout fought in the Super-Middleweight division. Shields meanwhile will come into this fight off of a ten round unanimous decision over Femke Hermans in December of last year. It is logical to assume based not only on the fast-paced nature of Women’s Boxing where rounds are only two minutes in duration, but more importantly the styles of the two fighters in being boxer/punchers who each know how to win rounds that this fight might go the full ten round distance. What could be the determining factor in this fight is which fighter can dictate the combat. The Hammer-Shields fight represents the first time in the sport of Women’s Boxing where the term “Super Fight” is appropriate. After all, you have two undefeated world champions who are two of the top fighters in the sport putting their respective records and world championships on the line against each other to determine who is the best. When you throw in the apparent dislike between the two and the notion that the encounter has become one of the most anticipated fights in all of Boxing in 2019, the term “Super Fight” is certainly appropriate. What this fight also represents for Women’s Boxing is only the second time in the sport’s history where a fight will determine an Undisputed world champion following undefeated undisputed Women’s World Welterweight champion Cecilia Braekus. It should not go unnoticed that after years and years of sporadic television exposure where several top female boxers have either retired or have gone into other combat sports, we are now at a time where Women’s Boxing is finally getting the recognition and spotlight it truly deserves as in 2019 there are arguably more Women’s bouts being televised across both traditional television and digital streaming networks than at any point in the sport’s history. One can only hope following great fighters like Christy Martin, Lucia Rijker, Mia St. John, Holly Holm, Ann Wolfe, Laila Ali, and others who fought during times where Women’s Boxing was not getting the exposure and recognition that it deserved that no matter what happens on Saturday night when Hammer and Shields meet for the Undisputed World Middleweight championship, Women’s Boxing will continue to benefit and grow from the exposure and more importantly respect that in this observer’s eyes is long overdue. The sport of Women’s Boxing deserves it. Hammer vs. Shields takes place on Saturday, April 13th at the historic Boardwalk Hall in Atlantic City, NJ. 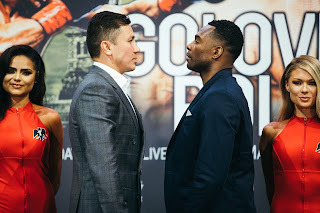 The fight can be seen on Showtime Sports beginning at 9:10PM EST/6:10PM PT across cable and satellite providers as well as on the Showtime and Showtime Anytime apps on mobile, tablets, and connected streaming devices. For more information about Showtime, Showtime Boxing, Showtime Sports, and the Showtime and Showtime Anytime apps please visit: www.sho.com. In the United Kingdom and Ireland, the fight can be seen on BoxNation beginning at 1:30AM (Sunday, April 14th Local UK Time.) For more information about BoxNation as well as availability in your area please visit: www.boxnation.com. Check your local listings internationally.